Rome, the capital of Italy, has a reputation for being one of the best tourism spots in the world, and people travel to this historic city for multiple purposes throughout the year. A vacation tour to the Italian city is something that has always attracted tourists in droves. If you are planning to make a trip to Rome, but shortage of time is an issue, know that you can visit most of the major attractions of the city in just three days. It is not hard to get around the city as its transportation system is effective and comfortable. Make a list of the places you want to visit during your three-day stay in Rome. If you have no idea where to begin your journey, you can check out websites that offer information on Rome travelling. Put everything on paper as you won’t have enough time to select places-to-visit after you have reached the city. You can also work with a guide or a travel agent who can identify the places to visit. The list should also include the expected time you will spend in each place, and transportation means (public or private). Start your journey early in the morning as Rome is calmer during early hours compared with evening (rush hours). If you have never been to the city before, you’d better get in touch with a professional guide who can give you directions and maps, without you having to worry about finding the places. Visit the historic places in the city first. Rome boasts of dozens of historic landmarks such as the Circus Maximus, the Pantheon, the Roman Forum and the Colosseum. Visit the places early in the morning so that you can explore them without any hassle. The Colosseum, which has stood since 70-80 AD, is said to be the largest amphitheatre. You will learn many more things about Roman Empire during your visit to the place. After visiting the historical landmarks of Rome, you can sit back and relax in the evening. Visit any restaurant during evening and walk through the areas exploring the city life. In the night, you can visit the Spanish Steps. Devote the entire second day to the Vatican City, which has its own reputation and is regarded as a separate place due to its religious importance among Christian world. 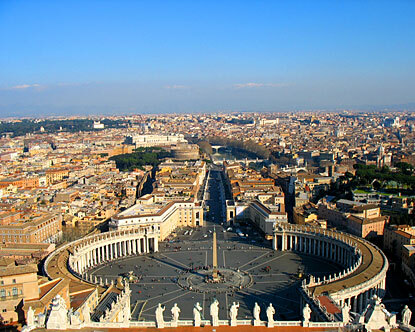 Infact due to its importance, the Vatican City is regarded as an internationally recognized independent state. Spend the third day watching random places, or places that you missed during the first two days.